Sherlock is back with a bang. 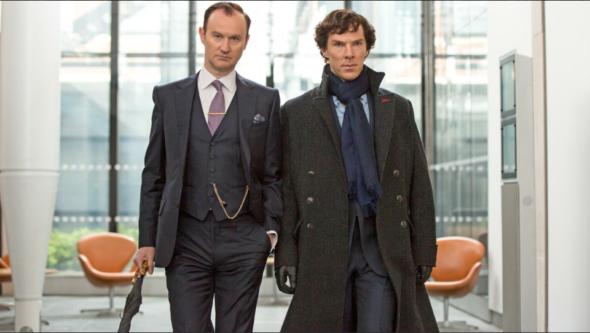 Deadline reports the season four premiere brought in big ratings for BBC One. The popular UK drama, which airs on PBS in the United States, stars Benedict Cumberbatch as the world’s most famous consulting detective, Sherlock Holmes. The cast also includes Martin Freeman, Una Stubbs, Rupert Graves, Louise Brealey, Mark Gatiss, and Amanda Abbington. The season four premiere, which debuted on January 1st, brought in a reported 8.1 million viewers in the UK. The episode, titled “The Six Thatchers,” saw Sherlock dealing with the birth of Watson’s (Freeman) first baby with his wife, Mary (Abbington). Sherlock continues with a new episode next Sunday, January 8th, and the season (possibly series) finale is slated to debut on January 15th on PBS/BBC One. In terms of future seasons, creators Mark Gatiss and Steven Moffat have both said the end of season four has a sense of finality to it, but they are not writing out the possibility of a fifth season. What do you think? Are you a fan of Sherlock? Did you enjoy the season four premiere? More about: BBC One TV shows: canceled or renewed?, PBS TV shows: canceled or renewed?, Sherlock, Sherlock: canceled or renewed?